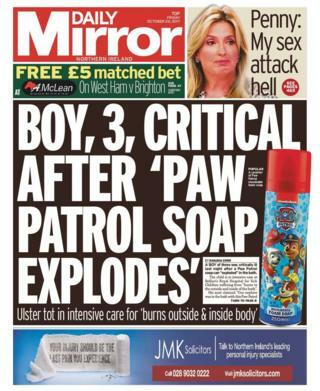 The Daily Mirror leads with news that a three-year-old boy is in a critical condition in hospital after a canister of foam soap exploded in his bath. The child is in intensive care at Belfast's Royal Victoria Hospital suffering from "burns to the outside and inside of the body," the paper reports. The boy was initially taken to Altnagelvin Hospital in Londonderry. There have been calls to remove the product, Paw Patrol Mouldable Foam Soap, from shop shelves following the incident. There is still a lot of politics in Friday's papers but there is some movement away from the stricken talks process. The News Letter tells us: "MLAs cost £10m since collapse of Stormont." The paper has reckoned that MLAs have spent just 46 minutes in the Northern Ireland Assembly since January. The News Letter calculates, however, that MLAs have cost a total of £10m in total since then. We cannot give them full marks for this question, however, as they have not showed all their working out. Speaking of costs, a former Stormont deputy speaker and former South Down MLA makes the front page of the Irish News. Caitríona Ruane resigned her position as deputy speaker yesterday after it emerged that she was still receiving a salary for the role, which she said she donated to charity. She remained as deputy speaker as no new deputy speaker had been elected due to the political impasse at Stormont. The Belfast Telegraph tells its readers Ms Ruane lost her seat at the last election, in actual fact she did not stand. The Telegraph reports TUV leader's Jim Allister's delight at the resignation ,for which he claims credit having brought the story to the attention of the media. The story is mentioned in two of the four Northern Ireland daily papers but is not the lead story in any of them. Both the News Letter and Irish News interpret Sinn Féin's response as its distancing itself from its former MLA. Staying in the political world, the Irish News tells us in its lead that the "DUP is facing pressure to distance itself from loyalist paramilitaries after police revealed the scale of a probe into UDA activity in west Belfast". The Irish News reports that a court has heard almost 30 people are being investigated by the PSNI in relation to the Shankill unit of the UDA (Ulster Defence Association). The paper says this "follows weeks of controversy over the DUP's response to issues involving loyalist paramilitaries". The DUP, however, issued a statement saying it did not endorse paramilitary activity of any kind and that there is "no place for any paramilitary organisation in our society". The News Letter has a two-page feature on the murder of Paul Quinn. The 21-year-old from Cullyhanna, County Armagh, was beaten to death in County Monaghan 10 years ago. His family says he was murdered by the IRA and have called on those responsible to hand themselves in to "clear up your conscience". The News Letter reports that there is considerable political anger with former Sinn Féin minister Conor Murphy, who appeared to label Mr Quinn "a criminal" following the murder. He has faced calls ever since to "remove the slur". The Belfast Telegraph also covers the anniversary of Mr Quinn's death and his family's call for justice. The Telegraph's editorial calls for a power-sharing deal to restore Northern Ireland's political institutions in order to deal with problems in the health service. In the News Letter's opinion pages, former rugby player and conservative politician, Trevor Ringland, writes that "Northern Ireland is actually as 'British as Finchley'... and it is also as 'Irish as Cork', referencing recent arguments over identity. In non-political news, the Irish News reports that planners have been urged to stop development at Knock Iveagh, near Rathfriland, County Down. It is feared that plans to build a 15m telecommunications mast on the hill could damage a Neolithic cairn.